The sun was shining, the sky was blue, and the only sounds whispering through the streets were the gentle moans of the undead... Can you and a friend survive the Horde together, or will you use that beating heart across the table to save your own skin? 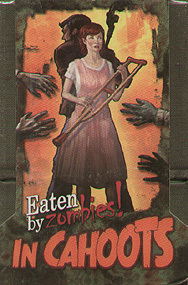 In Cahoots is the next instalment in the smash hit deck building game of zombie survival, Eaten by Zombies! Featuring new Swag and new Zombies. In Cahoots can be played as a two-survivor standalone, or as a two-player expansion to Eaten by Zombies!